It’s been a cold winter, with temperatures in the single digits. Storm after storm has swept in from the ocean, dumping rain and snow across the Pacific Northwest. We’ve had some warm spells, too; the past week we have been enjoying temperatures up around sixty degrees Fahrenheit. The snow has melted off in the valleys, although a good snow-pack remains in the mountains. My brother suggested we try to get to a favorite camping spot on the ridge behind my house, just to see if it was possible yet. Saturday morning the sky was overcast but the rain was tapering off. Just after eleven we hopped on our sidecars and headed up the hill. Andy was riding his KLR with a homebuilt enduro-style sidecar and I was aboard my Triumph Scrambler/Sputnik combination. The direct path, up Neal Creek Road, was bare mud for a couple of miles but above the gravel pit, where the road starts to climb, we ran into snow. At first it was fairly shallow and well packed, but it rapidly got deeper and softer. Before long the sidecar mounts started plowing snow. The added drag caused the rear wheel to dig in and soon we were stuck. Just up ahead there was a bridge; the steel deck was free of snow. If we could make it that far we could turn the bikes around without having to break out the shovels. I stood on my passenger peg to unweight the sidecar and get more traction at the rear wheel, but the tire spun down to the mud and the bike didn’t budge. Dismounting, I rocked the bike, alternating between throttle and clutch until the Triumph rolled forward, out of the hole and up on top of the snow. Not daring to stop, I ran alongside the bike and got a little farther. Finally, with Andy pushing the sidecar while I used the throttle and pushed from the other side of the bike, I was able to make it the last few yards to the bridge. Above the bridge was a level spot with bare ground. The snow had melted off where someone dug it up getting turned around, so I rode past the bridge and parked in the clearing. I got off the bike and walked with my brother back down to his bike to help him up the hill. He got a little farther than I did, but still needed a push to make those last few yards. Andy has more clearance under the KLR and his sidecar is lighter than mine. I think he might have been able to make it without assistance if he’d put the tire chains on. Going down was easier, but the ruts sucked Andy into the brush and it took both of us to get him out again. We backtracked to the pavement and drove past my house to Highway 35. We headed towards Mt. Hood, to have another go at it from a different direction. Turning off the highway onto Pinemont Road we began to climb steeply. The pavement was bare but there was about two feet of snow clinging to the slope above the road. The ridge where we were heading was above the trees on our left. The snow looked deeper up there, but Andy thought the roads had been plowed. At the end of the pavement we took the 1710 cutoff to the ridgetop. The road was bare mud flanked by huge curling walls of snow thrown up by the plows. Unfortunately, our intended route down Neal Creek Road was still buried under snow and blocked at the junction by a bulwark of ice and rocks. We didn’t attempt to ride down there but we walked in a short distance. The grey clouds had given way to that perfect blue you only see in a winter sky. The trees were younger here, the firs a deep formal green, the pines brighter green with red bark. We trudged through a clear-cut where the snow was as flat as a lake and glistened in the winter sun. I reached down expecting a hard glaze of ice, left by successive rain storms and freezing nights and was surprised to find the top two inches to be almost liquid. The warm morning had left a layer of ice granules floating in water trapped on top of the frozen snow. It was beautiful, but difficult walking, so we turned back before we’d gone very far. At the snowed-in junction of Neal Creek was another road, plowed and surfaced with pit run. We drove up it, looking for a shortcut to Fir Mountain Road, but it ended at a logging deck. The road was cut across a hill and covered with large rocks and wood debris. I turned the Triumph around on the loose, sloping surface and forced my way, bouncing and slipping, back up the hill. When I looked in my mirror, Andy was nowhere to be seen. My brother tried to follow me but didn’t quite make it around. Turning right put the sidecar above the bike and when Andy hit a bump the rig flipped on its side. It went over in slow motion and he couldn’t shift his weight enough to stop it. After a brief struggle to extract his leg from under the bike he emerged unscathed. I ran back down the hill and helped him right the outfit. It took both of us pushing to get him started back up the hill, tires spinning and spitting rocks all the way. Back at the main road, we headed towards Fir Mountain, hoping to find a prettier place to stop for lunch. We were pleased to find the road plowed the entire way. It opened up at an old clear-cut affording us a view to the west. Across the Hood River Valley and the Columbia Gorge we could see another storm blowing in. The sky was darkening and the temperature began to drop. We continued for another mile before we paused to eat, sheltered from the wind by a stand of tall firs. 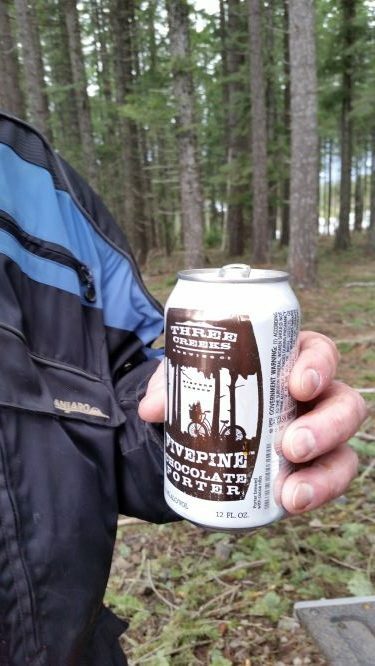 I’d packed some corn bread, cheese and sausage; Andy brought a couple of cans of chocolate porter to wash it down. It was a fine repast!! After lunch we followed Fir Mountain down to the junction of another spur road which is the back way into our campsite. This road was impassable, closed off by a big berm of snow and partially submerged beneath running water. We stopped again and I pulled a couple of tin cups, a thermos of hot cocoa and a flask of rum from my pack. Wrapping our hands around the steaming mugs, we let the drinks chase the cold away. We were only a few miles from home now, but we weren’t out of the woods yet. I had one more stop I wanted to make. Just before the intersection with Swyers Drive is a steep, bare knoll above the road. Shorn of trees, it sticks up above the surrounding hills. Large rocks, muddy pools and a couple of six-foot berms obstruct the track to the top. I pointed the Triumph up the knob and rolled on the throttle. Andy followed me to the top on his KLR. We were soaking wet and covered with mud by the time we gained the summit. Celebrating our successful ascent, we finished off the hot chocolate and rum. and we could drive safely. Eventually the rum did wear off and it started rain. It was time to suit up and head down the hill. The descent was uneventful. Safely back on Fir Mountain road, we turned left, down Swyers Drive, soon reaching pavement and then home. Back at the house I fell asleep sitting up with my boots on. It had been a good day.